Toyota has revealed a new seven-seat family SUV that will arrive in its Australian dealer showrooms towards the end of October. Known as Fortuner, the new SUV will expand Toyota's market-leading SUV line-up to six vehicles - joining RAV4, Kluger, FJ Cruiser, LandCruiser Prado and LandCruiser 200 Series. 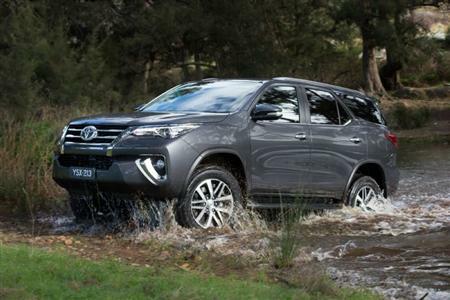 Toyota Australia's executive director sales and marketing Tony Cramb said the world premiere heralds a stylish and refined vehicle that is remarkably tough and offers genuine 4WD ability. "Fortuner's strength and refinement ensures it is equally at home on the school run as on the toughest off-road trails found in Australia," Mr Cramb said. "Fortuner shares the rugged underpinnings of the 'unbreakable' HiLux, allowing owners to travel to - and return from - places many other SUVs simply can't go." "At the same time, Fortuner's unique design suits the advanced tastes of modern SUV buyers while being equipped with a comprehensive list of features appreciated by families and business owners." 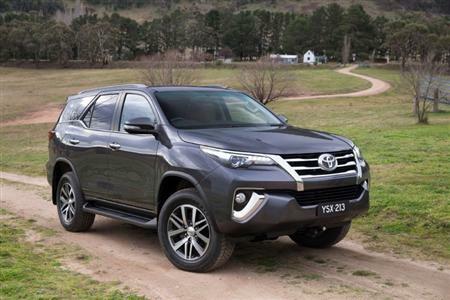 "Fortuner provides a diesel alternative to the petrol-only Kluger range as the new entry point for customers looking to purchase a large Toyota diesel SUV." 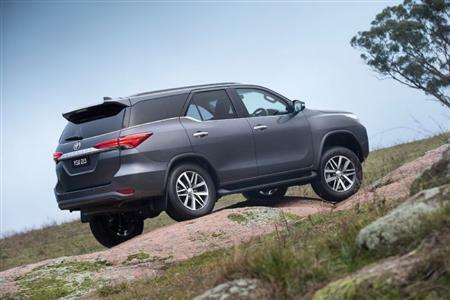 Fortuner will be offered in Australia in three grades - GX, GXL and Crusade - all powered by Toyota's new 2.8-litre direct-injection four-cylinder turbo-diesel engine that develops up to 450Nm of torque. A new six-speed manual gearbox includes 'intelligent' technology on GXL and Crusade grades to ensure smoother shifting by matching engine speed to transmission speed. A newly developed six-speed automatic transmission is also available. All variants are fitted with trailer sway control, which is designed to assist if a towed vehicle becomes unsettled by crosswinds, bumpy roads or sharp turns of the steering wheel. Maximum braked towing capacity will be three tonnes for the manual and 2.8 tonnes for the auto when appropriately equipped. A part-time 4x4 during day-to-day driving, owners can turn a dial to access Fortuner's impressive four-wheel-drive ability in high or low range. The suspension package was developed and tuned by local engineers to meet Australia's harsh conditions, with double wishbones at the front and a five-link, coil-spring configuration at the rear for impressive handling stability and ride comfort on all surfaces. Front and rear stabiliser bars suppress body roll. The vehicle's off-road prowess is enhanced by a rear differential lock with the componentry placed within the differential housing for greater off-road protection. All variants will feature front and rear air-conditioning, large touchscreen audio displays, Toyota Link connected mobility (limited coverage at user expense), side steps, 17 or 18-inch wheels, disc brakes front and rear, and an air-conditioned compartment that helps keep drinks and food warm or cold. "These accessories - including alloy and steel bull bars compatible with the vehicle's safety systems - build on the strong global platform and specifically meet the needs of Australian buyers," Mr Cramb said.